Alex J. Cavanaugh: THE STORM HAS ARRIVED! CassaStorm Now Available! Plus Cassa Facts, Trivia, News, and More! THE STORM HAS ARRIVED! CassaStorm Now Available! Plus Cassa Facts, Trivia, News, and More! Today’s tour spot is very special. Three years ago, a book blogger in Germany posted a review of CassaStar. He continued his support of the series by hosting me on CassaFire’s release day. And now, I am honored to be featured at Edi’s Book Lighthouse on CassaStorm’s release day with an interview, review, and giveaway. Edi, I continued this series for you. Thank you, my friend, for demanding more of me than I thought I could give. You rock!! And tonight is the RUSHED Twitter Party! Between 8:00 and 9:00 pm EST, follow the hashtag #RUSHED for an hour of fun, questions, answers, treasure hunts, and giveaways. Hosted by the awesome Lynn Rush and featuring giveaways from both of us. It’s my first ever Twitter party, so please join us tonight! One person will be randomly selected each day and the five names will be drawn from a hat – first person gets first choice and so on. This week I will be featuring my tour, unique Cassa facts, trivia, and prizes every day. Plus others are announcing CassaStorm’s release, and almost every post features a unique interview question. List of participants on the CassaStorm Page. So join the fun! Launch Day – Final Book! Today isn’t just CassaStorm’s release day! Tony Laplume also released a book this week - The Whole Bloody Affair. Way to go, Tony! Rachel Schieffelbein’s story, Seeing Red, is featured in a steampunk anthology from Spencer Hill Press. Real Girls Don’t Rust is available today – congratulations, Rachel! 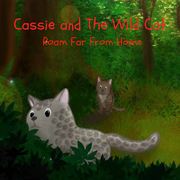 Pat Hatt’s latest is out – Cassie and the Wild Cat. Congratulations, Pat and your little rhyming cat! Bryan and Brandon have a new book out – The Graveyard Shift, a collection of horror stories. Congratulations, guys! A must read. Kittie Howard revealed the cover for her upcoming book. Louisiana's A-Z Something Extra: Lagniappe is a personal and historical journey through the Bayou State that will launch in early October. Congratulations, Kitty! How hard is it to find the right title for a book? Since I’d never planned more than one book, I’d also never given consideration to other titles. When I submitted the manuscript to my second book, it had no title. My publisher made some suggestions and we narrowed it down to two. CassaFire became my second book. I submitted my third manuscript and it also lacked a title. However, I had one in mind by that time, and after speaking with my publisher, we made a decision. 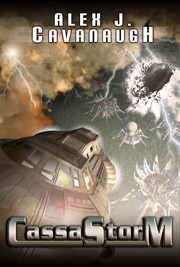 The title that hadn’t worked for CassaFire fit perfectly – thus CassaStorm became my third book. So if you’re trying to decide on a title, don’t panic! Just keep it simple, logical, and true to your story. 6 – At the time, it was the most expensive television show ever. How much did each episode cost to make? One million dollars! Huge thanks to everyone who has visited my tour stops and posted the announcement so far! Who is your favorite book blogger? Picking up some new books this week? Get any of the trivia right? And how hard is it for you to come up with a book title? Don’t forget to visit Edi’s Book Lighthouse today and catch the #RUSHED Twitter party tonight from 8-9:00 pm EST – lots of prizes! Congratulations mate! Well done on your third novel in the trilogy. But your last book? I don't think so! Looking forward to novel number four. As always, so much happening in the 'sphere. Thanks for giving us the goss. You're as busy as ever Alex, but endless congratulations to you for the tour and to you Lynn Rush for the Twitter party. Congrats on CassaStorm and your whirlwind tour! Enjoy Lynn's special Twitter party in your honor, and I can't wait to hear all about it! Congrats to all of the other authors as well! Congrats to all the authors with new releases/features and thanks for the links. Your last book? But not the end of your writing, I'm sure? On another blog, I read something about the possibility of a short story? Is that true? Was that a moment of jest? Or are you not telling at this particular time...? Huge congrats, Alex. Very well deserved as you've worked so hard. I'm terrible with titles, it takes me ages to come up with any ideas and then they're not very good! It's something I need to work on, I think. Congratulations Alex, may this particular storm be successful. Good Luck to a well deserved Author. I'm very curious about the CassaStorm. I hope the book will meet my expectations, and I hope the overall success rate (selling figures, ratings, positive reviews) will meet you expectations as well. Yay. You're rocking with your release and mentions everywhere. Happy book birthday! Getting CassaStorm as soon as my salary comes in. Ahem. Heading over to Edi's now. Alex, your launch is a smashing success and I'm so happy for you - leaving for airport in less than an hour, but will purchase your book when I get home. Continued good luck, my friend. Congratulations with your book's release! Your book sounds really wonderful. Denise, thanks and we shall see! Michelle, I have an idea for another book, just don't know if I will continue writing to tell the tale. Laura, I struggle as well. Zoltan, so far everyone has said it's the best of the three, so hope it won't let you down. Not sure about another book though. Karen, safe travels and appreciate that. Siv, all three of mine are unique, which is really cool. nice...congrats on your book launch....and cool to see Pat's book there as well...storm on...smiles. Congratulations on your latest release and tour! I have major issues in trying to come up with a pertinent title. For a novella that I was recently querying, it took me about two and a half weeks to come up with a new title (original one sort of gave the entire premise of the novella away). For another, it's been going on three months in trying to come up with a new title for it. While it's very import to come up with good short title, it's also equally important to make sure that it not only connects with the story but actually makes sense. That's great about getting on a blog in Germany! Blogging is truly an international phenomenon. I've hosted writers from Spain, the U.S., The Republic of Ireland, and the UK. I'm always looking for more! Yet Another Great Storm Is At Hand!!! I am sure many more storms to follow! We Wish You and all the following activities in relation to this a great success. Happy Release Day! Congratulations, Alex!! Congrats! Alex, I am sure CassaStorm will be just as awesome as the first two installments! Best wishes! Sounds like a great book, Alex! And yes, unique, short names are good. Looks like I'm going to miss your twitter party. Why oh why does the earth have to be round!? Congratulations, Alex! You've got another great book! Know your tour will also be a huge success. And thanks for the shout-out! You rock! BG, thanks, and titles are tough. It really does have to connect with the story. And the readers. AJ, Edi and his site are awesome. Lynda, that made me laugh. Elise, would you like us to flatten it for you? Kittie, thanks and you're welcome. Thanks for the plug, and congrats on the day of release! Having followed your blog for almost a year now, I know how hard you work. I am truly happy for you Alex. Congrats! That shout out to Edi really made me smile, Alex. I'm excited for you and I hope your book tour is nothing but fun!! Another book from the cat? Doesn't that cat take a nap?? Hey, Pat - give that cat some catnip!! Congrats on your book release, Alex. So excited for you. And that's amazing your publisher kept your title. Thanks for a fantastic day on my blog yesterday. I've been commenting directly to people who stopped by and there have been a whole bunch more last night. Off to visit everyone's blogs like you recommend and I already do. I'm sorry I missed yesterday. Darn. I may have been able to get some of those trivia questions too! Elise, thanks, and your comments made me chuckle. Natalie, thank YOU! And I will check back in a little bit. Heather, thanks and no worries. CONGRATULATIONS, ALEX!!!! Just bought my copy and Im loving it already :D BTW you've inspired me to get out of bed an hour earlier every day and give some much needed love to my WIP :-) So thanks, man!! you are everywhere...must be the clones. Congrats on your recent award, and the release of your newest book! Okay, y'all are wearing me down. I don't usually read much in the way of science fiction, but I simply MUST read your books. From all I've heard, they're terrific. Congratulations, you are everywhere today, and tomorrow, and on and on and on! You're taking over the internet! Thank you for sharing that nugget of title wisdom! I am rather known for my lack of titles :) My writing mentor used to get so annoyed at me for not naming a book. I just can't seem to give a book a name unless it's "perfect". Ugh...looks like I have a lesson in simplicity coming up, huh? Sounds like you've had quite a journey. Books, like people are unique, and deserve to have serious thought put into them. Congrats on bringing your books to fruition. Best of luck also to those who have new releases. Randi Lee, thank you! Hope you enjoy it. Glad you are working on your manuscript now. Susan, thank you! I'd be honored if you did. Madeline, it was meant to be. Jen, naming a book is difficult! And I can't believe I forgot the name Muffit. My grandmother named her dog after that character because we watched that show together. Congrats, Alex! Creating an exciting book series is no small feat. Many, many happy book sales to you. Congratulations, Alex, and all the other authors with book releases! What a fantastic accomplishment. Have a great day, you worked so hard on this trilogy... much success! Congratulations to you, Alex, on CassaStorm's release and to all the other Ninjas you mentionned for their new releases, too! Going to check out Edi's Lighthouse and will try to pop in for the Twitter party tonight. The Ninja army seems to have pretty much taken over the internet, I'm sure the book will be a hit! Congratulations on charmed #3, Alex! Now that CassaStorm's been released to the wild, you can sit back, relax, and take a breath. Ha! Just kidding—back to the keyboard with you. Wishing you much success with CassaStorm! Happy release day! We all wish you the best of success! Congratulations on your book tour-- I hope it's the most successful yet. Thanks again for the shout. Already bought yours this morning before my blog hopping. And there will be a book four one day I bet. Congratulations on your release! I stopped over and got my copy from Amazon. Looks like you're selling a lot already! I'll see if I can stop by the Twitter party tonight. Hope you have a good turnout! Congrats, again. Off to get my copy FINALLY! It's been a long wait...but worth it. The reviews look fantastic. Enjoyed the inside info on title picking. Tyrean, appreciate that! Enjoy. And cool you had a dog named Muffit. Morgan, and I'm still working. LuAnn, hope you can make it! Pat, you're welcome, and thanks!! Sherry, thank you! Hope you can make it. So excited to be a part of this tour! Love the book's titles, I'm glad you got to keep them. I always love series titles that have a theme. Congrats to you and to the other wonderful writers on your list for new releases. I like your titles. I am NOT good at inventing titles. Glad to know you didn't have much issues with finding titles and let me tell you they are ALL awesome! Congratulations to Tony, Rachel, Pat, Bryan & Brandon, and Kittie! Now, stop holding me back, let me go read your Spotlight over at Edi's! Congratulations Alex! The big day arrived! I wish you much success! Making myself a note about the twitter party. Sometimes a book title comes to me easily but my editor picked my last title and I'm glad they did. It's been my bestseller. Today is the big day! Worthy of a party. All that hard work. Great job. Congratulations Alex on CassaStorm's launch. Eager to read it. Here is hoping that the book is a super success and is made into movies (hoping fervently that from my lips to God's ears its a short journey). Lots of hugs, Alex. Congrats! I am trying like crazy to get my post up for you. But the info. is trapped in yahoo, and it won't let me access it right now. Not sure what's going on, but I will definitely, definitely get it up as soon as I can. I just didn't want you to think I flaked out today. Alright, congrats on the launch! Happy release day, Alex!! So happy to have been a part of this! Congrats, Al, on this amazing journey. It's been a privilege to watch you navigate it. When you wrote that first paragraph of your first book, I bet you had no idea you would get this far. That video is spectacular! Best wishes! ongratulations, Alex. You are a father, again! And you have some wonderful "children" indeed! What a great day this is! I'll pop over and check out the interview, but I'll have to skip the party. Chrys, thank you - hope you enjoy it. Deniz, the theme just worked. Susan, be cool if you could make it. Rachna, hope you enjoy it. Susan, I saw it - flaking avoided! Jean, those books are the best kind of kids. So EXCITING!!! Congratulations and I know this one will fly just like the other - yay Alex :o) !! Congrats Alex! I hope to be reading it within the hour. If this were a just world, we'd be seeing "CassaFire" starring George Clooney and Sandra Bullock coming out next month. As it is, I'm sure that'll be in the future, given the amazing amount of work and incredible level of talent you display. This tour is great, Alex, and I wish you well on the publication. CONGRATS on the book release Alex! Alex, I must catch up on your books. They look fantastic, and the excerpts and reviews are terrific. Best to you! Cassastorm is the GTA V of book world. congrats on the book and the trilogy. Congratulations, Alex! Happy release day! Many congrats, Alex! Hope you have a fantastic release day, and tons of sales. Last book? When you were at Meilori's playing your guitar (details on my blog tomorrow), you mentioned an outline for ANOTHER SPACE EPIC. You have it in you. I know you do. Congrats on a wild ride today! May you have a successful twitter party, tonight, Alex! Whatever works for getting the word out. I think your variety in the posts is setting a new standard. Great idea. Good Luck! Good thoughts on individual book titles in a series. I'm gonna have this issue myself and really no concept of how I'm going to approach it. Oops! Today's the day. Congrats, Alex! your comment is touching and a thousand words could not express what I felt when I read it. I loved to read your books and it was and is an honor to be part of the extraordinary Ninja Army. Without ever met you in person I want to say that you are really an honest und true friend and may the future shine bright for both of us. I was wondering who came up with the title of CassaStar. My guess was that it was your publisher, now I know I was wrong. Yet it is cool that when you search for it, only your books appear. Other books have so common titles that you get like ten or more from the search engines. It's better to be original. Thanks, Briane. Just so long as the SyFy Channel doesn't get them. JJ, thanks - hope you enjoy them. Samantha, I wish it would hit Hollywood. Julie, hopefully you get lucky like I did. Edi my friend, you are one in a million. Meant every word. Might have to fly to Germany and buy you a beer. Congratulations again and again, Alex! I hope there is another book in a near future! Successful launch day! May you sell millions. Congratulations on your book's release and the completion of a trilogy. Keep rockin' the Ninja world. I love how you continue to support other writers even on your own special day. Those are some amazing reviews, too. Alex, good sir, you are the epitome of excellent interaction. Good of you to mention those other links. Pat in the Hatt and his rhyming cat. Supportive friends are the best but supportive strangers are just amazing. Clicking over to Edi's now. you are a rock star!!!!!! Congrats Hugs! Book titles are the hardest for me. I usually have to ask for help from people who have read the drafts. Congratulations again, to my favorite book blogger. As for a title, I have one, I am struggling with the book. Sorry I forgot #rushed. Sorry to be so late to the party. CONGRATULATIONS ON RELEASING THE STORM, ALEX! I hope Byron's not insulted by my post today. Congrats on the launch of CassaStorm!! I see it everywhere...lot of love out there for you, Alex. Oops! I thought I was adding my own link to comment sign-off, but it's the last blog I went to and added it to my feed. I am a day late in saying Best Wishes for a great party! many many congratulations and all my very best wishes!!! bravo! Yay!!! Congrats, Alex! Enjoy the launch week!! Congratulations, my friend. A great big hug & a kiss on each cheek! I loved the interview/review from Edi's Book Lighthouse; very entertaining. I like what you said about book titles. I hate trying to come up with them so I am making an effort to keep it simple.